Samuel Pitman's birth was registered by his parents, Eli Pitman, an agricultural labourer, and Susan née Shield, during the first quarter of 1867. He was born in Tytherington, and by the age of 15 had left home to work at Acton House farm, Iron Acton. Samuel enlisted in the Royal Artillery on 3 January 1889 on a seven year engagement with five years in the Reserves. He spent all but his first year in India (where he suffered two bouts of enteric fever), completing his primary term in January 1897. 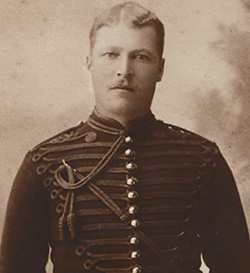 Samuel was recalled in December 1899, shortly after his marriage to Jane Hart, to serve in the Boer War with the 65th Field Battery throughout 1900 and 1901, for which he was awarded the Queen's South Africa Medal, with clasps for ‘Cape Colony’ and ‘Orange Free State’. In the meantime, Samuel had enlisted in the Royal Gloucestershire Hussars Yeomanry (in whose uniform he is shown in our photograph) and attended their annual training camps. On 5 August 1914, the day after war was declared, Samuel was embodied into the Army, and went with his unit for training in Norfolk. He became ill on 27 November and was hospitalised at Overstrand until 23 December, when he was sent home on sick leave. After a medical review concluded that he was permanently unfit for service, he was discharged on 6 May 1915, claiming a pension that was agreed for a period of one year. However, Samuel Pitman failed to recover from what had been diagnosed as pneumonia and pleurisy and he was buried in St Mary's churchyard on 24 November 1915. He is commemorated on Frampton's war memorial and the plaque in the village hall. At the age of 47, he had been prepared to fight again for his country, 'a steady, sober, honest and industrious soldier'.